Must Know Acoustic Guitar Rhythm Techniques That Will Change The Way You Play Your Guitar Forever! 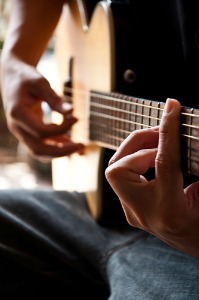 Are you fed up with always sounding the same when playing rhythm guitar on your acoustic? Ready to dramatically improve your guitar playing with some really cool and easy acoustic guitar rhythm techniques. This mini course is exactly what you need to take your acoustic guitar playing to the next level. No longer will you be listening to your favorite players, or jamming with friends, wishing you could sound like them. Now you will blow them away with your new found rhythm guitar playing skills. Learn the 5 key areas every acoustic guitar player needs to know in order to sound great when playing rhythm guitar. Not only this but learn how to combine these ideas for maximum effect! Have the “know how” to sound different every time you pick up your guitar, even if you are playing the same song! You’ll never be bored again with just simply strumming chords. Learn how to use riffs to create great sounding rhythm parts to a song. Sure you have heard this in music before, but do you know how to do this yourself when playing rhythm guitar parts? Learn how to make your rhythm guitar playing sound killer! People will be queuing up just to hear what it is you are playing, and how you are getting such a great sound. Have a collection of cool sounding ideas and techniques that you can use again and again on any song. No more frustration with sounding the same all the time with a “strum only” approach when playing rhythm on your acoustic guitar. So strap yourself in, because over the next 5 days this free mini course will take what you already know with your acoustic guitar rhythm playing and give it the makeover that it needs. You will also discover new and wonderful ways to approach your rhythm guitar playing so you will even surprise yourself when you pick up the guitar to play.